The American Metalcraft FSMEL117 square bowl has a 228-ounce capacity, which is perfect for serving dishes family style, on buffet lines, or at catered events. 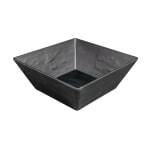 Adding a sleek look to tabletops, the bowl is square and resembles slate for a sleek, natural feel. Durable for use in commercial settings, this American Metalcraft FSMEL117 square bowl is constructed of melamine. This material will chip and peel in the microwave.